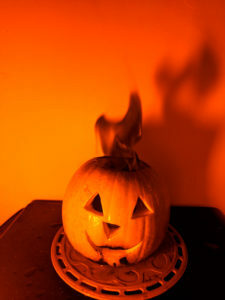 Shine a low pressure sodium lamp on a flame colored with table salt for a black flame pumpkin. First, there was the green fire pumpkin. Then, I made a rainbow flames pumpkin. That was cool, but then there was the flamethrower jack o’ lantern. How could I top that? Well, this black flames Halloween jack o’ lantern is less likely to require a fire extinguisher, and actually way more creepy! But, how do you make black flames? It’s really easy. I tested this project will rubbing alcohol (isopropyl), ethanol in hand sanitizer, and methanol. They all work fine. However, your best bet is to use 70% rubbing alcohol because it has enough alcohol to burn with a clean blue flame, but enough water to dissolve the salt. If you use high-proof alcohol, you’ll need to dissolve salt in a small amount of water and mix it with your fuel. You need a low pressure sodium (LPS) lamp. I got mine from Amazon, but some building supply stores carry them. You might luck out and work someplace that uses them for lighting. There are other kinds of sodium lamps (e.g., high pressure sodium or HPS), but they won’t work for this project. The LPS lamp emits nearly monochromatic light corresponding to the sodium emission spectrum. When you dissolve salt and add it to fuel, you make a yellow sodium flame that absorbs the light from the lamp. When light gets absorbed, you see darkness (black). It’s like a black hole, without the gravity. First, turn on the LPS lamp. It takes several minutes for this type of bulb to reach the orange-yellow final color that you need. Place the light where it will shine on the flames that come out of the pumpkin. Use a long-handled lighter to ignite the fuel. Admire the amazing black flames. This project works in dim light (not counting the LPS lamp), although the black flames may appear more indigo and you may see some yellow and blue from the flame. The flames are likely to appear yellow with black edges. They will cast a cool shadow. However, if your only light source is the LPS lamp (like, at night), the effect is far superior. The monochromatic light from the bulb turns everything orange-yellow shading to black. The black flames are much darker and the pumpkin looks like something out of a horror movie… except it’s real. The black flames might look different from ordinary fire, but I assure you they are every bit as hot as you’d expect. Black fire can burn you. Only light a jack o’ lantern in a fire-friendly location. Don’t let kids, pets, or fools play with the lit pumpkin. Most important: Only add more fuel to the pumpkin after the flame is extinguished. Here’s exactly what I did. While making the video I discovered (belatedly) the effect works absolutely fine with other light sources in the room. So, if you’re thinking of using the the black flames jack o’ lantern for a party or trick or treaters, you don’t have to turn out the lights. Just put the LPS lamp near the pumpkin.